This entry was posted in Uncategorized and tagged Chapel Hill, City, Contact, County, Durham, Funding, Local, Orange, Petition, Representative, Taxes on August 28, 2015 by admin. GoTriangle forecasts an average of 24,000 weekday light rail trips by 2040. So assuming round trip travel, this would serve 13,500 passengers over 17.7 miles. Frequency of service reduced from the original proposal (of every 5 minutes) to every 20 minutes, and 10 minutes during peak commuting hours (Mon to Fri 6:00am – 9:30am & 3:30pm – 6:30pm). DOLRT estimated to take 56 minutes vs the original 34 minutes to travel from UNC Hospital (Chapel Hill) to downtown Durham and now continuing to NCCU at an average of 19 miles per hour. The estimated $1.6 Billion (DEIS 2015) “assumes 50% Federal funding, 25% local and 25% state.” $2.5 BILLION assumes 50% Federal funding, 43% local funding and 7% state funding, according to the GoTriangle. The local funding is comprised of a 0.5% sales tax, $10 annual vehicle registration fee and 5% tax surcharge on car rentals. GoTriangle has proposed a DOLRT financing plan that will increase the total cost to over $3.4 BILLION and stretch debt repayments for half a century into 2062. Whereas the construction or capital costs are frequently offset and subsidized by state and federal governments, any short fall in operating costs not covered by rider fees are typically subsidized (paid for) by local taxpayers in the form of additional local taxes.Of the estimated $16 $28.7 MILLION Operating & Maintenance annual budget, 20% is expected from passenger fares (fare-box recovery) leaving the remaining 80% (or $23 MILLION) in additional annual taxes for Orange and Durham county residents. Who can I talk to and have my voice heard? Some voices carry more than others. Your elected representatives will listen to you. You have the vote! How can I maximize my voice? Phone calls are heard very loud and clear. Hand written letters are the next best thing. Followed by typed letters delivered by US postal. And lastly email. So while most of us use (myself included) email … your elected representatives prefer to hear from you (literally). So if you want to maximize your impact, please call! This entry was posted in Uncategorized and tagged Chapel Hill, Daily Boardings, DOLRT, Duke, Durham, Funding, Gap, GoTriangle, RDU, RTP, UNC on August 28, 2015 by admin. 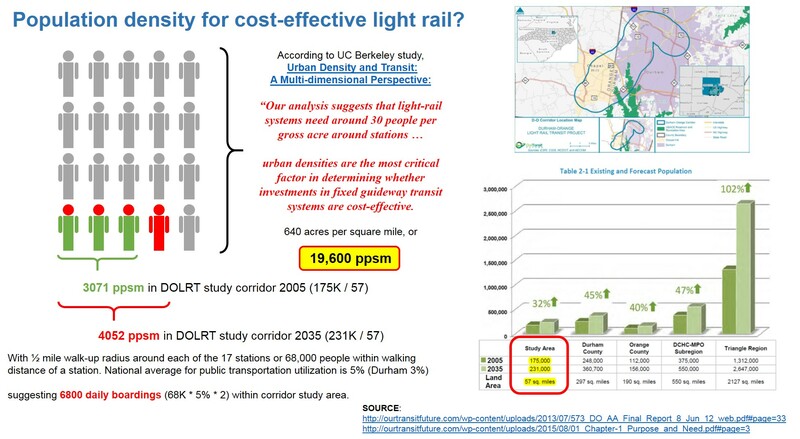 The promise, when Durham (2011) and Orange County (2012) residents approved the 1/2 cent sales tax / public transit referendum, was for DOLRT to cost $1.4 BILLION (in 2011) of which 25% or $350 million would come from local funding and take 34 minutes end-to-end to start service in 2025 with $14.3 million operating cost. Today’s reality, DOLRT will cost $3.4 BILLION (YOE) or 17.7 miles @ $192 million per mile, with 40% or $1 BILLION to come from local funding, travelling at 19mph and take 56 minutes end-to-end travel with service in 2029 with $28.7 million operating cost. For reference, Charlotte BLE cost $126 million per mile. And GoTriangle has yet to break ground! So 5 years into the project we get a slower train delivered 4 years later, requires 3X more local funding, costs 80% more to build (so far) that is financed into 2062, is 35% slower, 2X more expensive to operate, with 1/3 less platform capacity. Chapel Hill BRT will deliver mass public transit 7 years sooner at a fraction of the cost. In fact, FREE BRT service would be cheaper for riders (and taxpayers), while providing better service, sooner than DOLRT! For the cost of a single DOLRT mile, you could build an entire BRT system like Chapel Hill. For $2.5 BILLION, you could build 166 miles of BRT (vs 17 miles of DOLRT). Now THAT would be mass public transit! 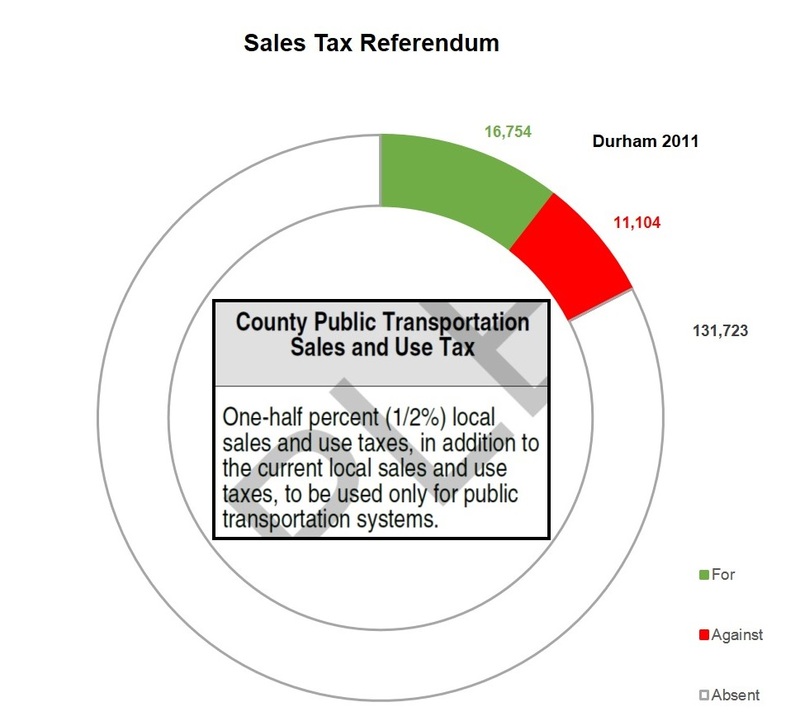 In 2011-2012, voters in Durham and Orange County approved a ½ cent sales tax increase to fund regional transportation needed for the growing Triangle Region. The tax was to provide partial funding for a plan developed by Triangle Transit (TTA – and now “GoTriangle”) to increase bus service, and provide light rail transit (LRT) connecting UNC and Duke. Last year, the situation changed when Wake County decided to not pursue GoTriangle’s plan and abandoned plans for LRT. Instead, Wake is exploring Bus Rapid Transit and/or Rail Rapid Transit (diesel cars running on existing rail lines) deliver county-wide transportation in a flexible, cost-effective manner. During the same period, GoTriangle has spent approximately $40 million on LRT studies and has provided a small increase in bus service in Orange and Durham Counties. The LRT planning process has been fraught with issues ranging from route problems to degrading assumptions about speed, capacity, and value to the community. The Durham-Orange LRT does not provide service to Wake County, the largest and fastest growing segment of the Triangle. Smart Transit Future is an alliance of community and civic groups throughout the Triangle that are asking Orange and Durham leaders to reconsider the DOLRT plan and pursue alternatives. We believe that the Durham-Orange, LRT should be put on hold, in order to work more closely with Wake County on alternatives that connect the entire Triangle. At the same time, funds in the short term can be redirected to improve bus transportation in Orange and Durham. The expected capacity, speed and convenience has degraded. Route travel time has degraded to 56 minutes from an original estimate of 34 minutes, and the existing bus routes used for comparison were grossly distorted (link to page showing comparison). DOLRT costs are escalating, and under new laws, the project will be short millions of dollars. Federal funding is even more uncertain. It does not serve the exploding growth centers including Chatham Park, NC Commerce Center, and the redevelopment of RTP. Durham and Orange County need more funds to modernize bus fleets and add routes, and implement BRT which is much more cost effective. The DOLRT relies on at 42 unsafe at-grade crossings along the 17 mile route. Bus Rapid Transit, Rail Rapid Transit and emerging technologies offer a more flexible and cost-effective platform for Triangle-wide transportation. LRT is expensive, inflexible technology that will not effectively serve the growing Triangle Region. Federal, state and local dollars would be better spent on bus and bus rapid transit with dedicated guideways through dense corridors, and the reuse of existing rail lines with rail rapid transit. With the final recommendations unveiled by GoTriangle. many communities are now actively seeking to stop this project. Upon deeper investigation, many of the GoTriangle planning assumptions are either highly questionable or so erroneous that making an informed decision on the options is impossible, We urge local, county, state and Federal decision-makers to require an independent review by external parties that have no role in the development of the PLAN and do not stand to benefit from decisions regarding the PLAN. We the undersigned urge you to REJECT the current DO-Line plan. This entry was posted in Uncategorized and tagged BRT, Chapel Hill, DEIS, DOLRT, Durham, FEIS, Funding, Gap, GoTriangle, Orange, Petition, Regional, Safety, Wake on August 28, 2015 by admin.